In the wake of the Western expansion, a fast growing number of non-European artefacts entered the European market. They initially made their way into princely cabinets of curiosities. Made possible by the forced opening and exploitation of more and more parts of the world and pushed by social and technological changes of the time, the 18thcentury brought a boom of the market of non-European artefacts in Europe. This came along with the emergence of a broader collecting culture and the development of a rich museumscape. 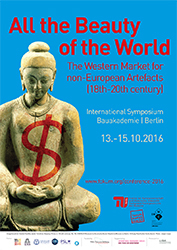 This market and its development in terms of methods and places of exchange and monetary and ideological value of the objects are in the focus of an international symposium organised by the Institute for Art History in cooperation with the Center for Art Market Studies at Technical University Berlin, in collaboration with the Institut d’histoire moderne et contemporaine (CNRS) and the Labex TransferS (PSL) in Paris. The keynote lecture will be given by Prof. Timothy Brook, holder of the Republic of China Chair at the University of British Columbia. The aim of the symposium is to examine how the market for non-European artefacts developed between 18th and 20th century and to which extend it was entangled with the history of museums and private collections. There is no fee for attendance but registration is requested. Please register with Christine Howald via email (c.howald@tu-berlin.de) indicating your name and institution.